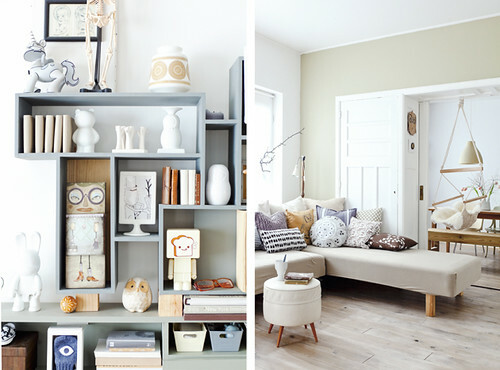 There is this amazing space in 101 Woonideeen magazine, a decorating mag out of the Netherlands, that I've been dying to share with you ever since I first saw it in their November issue. I love the space for many reasons but primarily, I'm nuts about this amazing DIY wall unit that the homeowner, Tinta, made for her dining area. 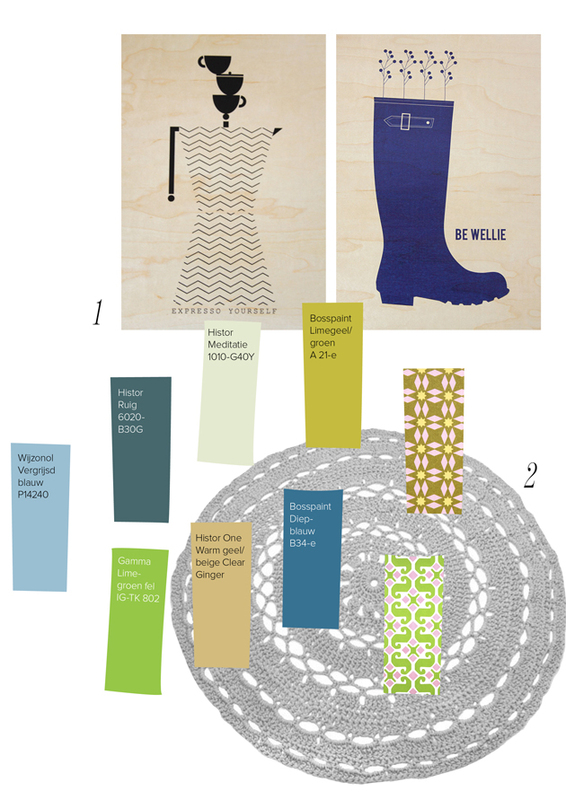 There is even a DIY tutorial in the issue as well as on their website (in Dutch). I think it's the absolute best shelving unit ever because of all of the little nooks and the sheer quirkiness of it. I also really like how she has styled it, so many fun things to look at. Sorry the photo below isn't super clear, it's all I could find online and the resolution isn't so hot but at least you can see the display unit that I'm so ga ga over. Do you spot the fun kid's book on the shelf, There Was An Old Lady Who Swallowed A Fly? from Chronicle Books? I do, and it's such a lovely book I highly suggest picking one up for decorative purposes AND to read! I own one and love it. I really like the mood board above that Tinta shared in the issue showing the overall palette for her apartment design. Such a fresh and inspiring mix of color, texture and pattern. She is also a fan of Tara Hogan's work over at INK + WIT which made me so happy since Tara is a friend of mine. Tara's work is more and more popular in Europe, I see it in magazines from time to time and hear people talk about INK + WIT whenever they speak of stationery that they love from the US. Go, Tara! Here's the shelf again, I know, but I've added an image from the living room which is laid out so beautifully I think. Ah, what a sweet home.